Former Warwick resident, Anna Marie Casey, was called home to heaven on Tuesday, January 15, after a remarkable 91-year run. She died as she lived: Gracefully. The Brooklyn-bred matriarch entered the world on September 1, 1927, to tough-nosed Irish immigrants, Patrick and Margaret Soye. As the eldest of two -- including her sister Eileen and live-in cousins, Jean and Mary -- Anna was a Depression-era baby with a flair for frugality, a deep curiosity, and penchant for quality conversation with family and friends. Affectionately known as “Princess,” Anna met her jolly knight, Eugene F. Casey, Jr., on a Brooklyn trolley car. She married the WWII veteran in 1948 and had two children -- her beloved daughter Rosemarie of New Hampton and son Peter Patrick, a longtime Edenville native. When the children entered Kindergarten, she returned to work as a school secretary and later earned a Bachelor’s Degree from Brooklyn College. Though her world revolved around family, Anna and Gene, her husband of 67 years, made quite a dent in their bucket lists, earning Passport stamps from Panama to Portugal. 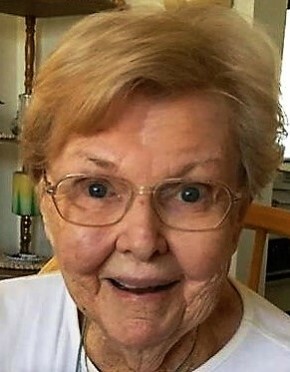 After Gene’s passing in 2016, Anna spent her last years near her aforementioned son and his wife, Theresa Casey, in Ocala, FL, enjoying sunshine, TV serials, and long afternoon siestas. She also leaves behind three grandchildren - Peter R. Casey of Riverdale; Robert Yuli and Marissa Hernandez of Brooklyn; and two great-grandchildren. Anna was predeceased by her sister, Eileen and granddaughter, Christine Casey. Visitation will be held Friday, January 25, from 2-4 pm and 7-9 pm at Lazear-Smith & Vander Plaat Memorial Home, 17 Oakland Avenue, Warwick. A Mass of Christian Burial will be celebrated on Saturday, January 26 at 10:30 a.m. at St. Stephen RC Church, 75 Sanfordville Road, Warwick. Following the mass, she will be interred with her husband Eugene at Orange County Veterans Memorial Cemetery, 111 Craigville Road, Goshen. At the time of funeral service we commemorate and reflect on the life of Anna Casey. In the days, weeks and months ahead it will be a comfort to family of Anna Casey to continue to remember a life well lived. Please select a date on the Calendar of Care to be reminded via email to reach out and continue the caring for family of Anna.